Kerry wants IDF Jordan border control gradually shift to PA, IDF drones to monitor Judea Samaria terror following withdrawals. 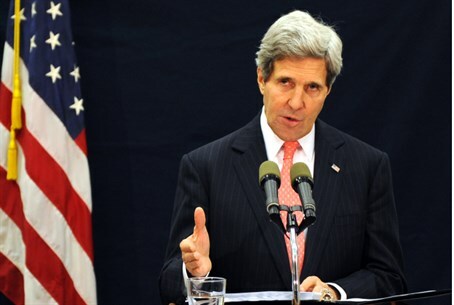 Additional details about US Secretary of State John Kerry's security arrangement plans were revealed in a report by Galei Tzahal (IDF Radio) on Tuesday morning. Kerry's plans reportedly give Israel temporary control of the Jordan border, soon shifting control to the Palestinian Authority (PA). The IDF will patrol the length of the Jordan border for the first few years of the US plan. However, after a few years joint patrols will be held with PA forces, with the cooperation of the Jordanians on the other side of the river. This aspect of Jordan Valley withdrawals in stages over 5 to 10 years matches the contents of Kerry's secret plan revealed by journalist Baruch Yedid to Arutz Sheva earlier this week. Yedid's revelations came from his extensive official and unofficial PA sources. Israeli withdrawals in the plan appear to include large parts of Judea and Samaria, as the new report mentions Kerry's intentions to build a massive border fence in the area. Regarding the security threat, of what is feared by many to become a terror state in Judea and Samaria, Kerry's plan would have the IDF deploy drones over the area to monitor terrorist activities and gather information. Apparently the presence of drones in Judea and Samaria is the "creative security solutions" Yedid spoke of, when he noted that Israeli security sources added such "solutions" to meet US demands when submitting the plan to Prime Minister Binyamin Netanyahu. While Israel has said Kerry's plan could be an opening for negotiations, PA Chairman Mahmoud Abbas has rejected the plan, and further called an Arab League emergency meeting in which they rejected the plan as well. Nevertheless, Kerry's aids have reportedly rented 50 rooms in a Jerusalem hotel for January to mount a diplomatic "attack" on Netanyahu, forcing him to accept the plan of Israeli withdrawals. Yedid's sources confirmed the reports, adding the Americans have also rented 2 or 3 stories in a luxury Jerusalem hotel for computerized equipment, maps and databases to aid their efforts. Analyst Mark Langfan has called the plan a "death-trap" for Israel. Langfan added that the plan doesn't even meet the minimum "defensible" borders presented in a secret 1967 US Joint Chiefs of Staff (USJCoS) memorandum, based on the military technology realities of 1967.